“A number of NRM MPs have questioned how the party’s Central Executive Committee appoints representatives on bodies like the Parliamentary Commission and the Pan African Parliament. The NRM CEC last week voted and forwarded the names of six MPs appointed to the two bodies” (NTV Uganda, 2016). The African Union Commission deployed a Short Term Election Observation Mission to the 18 February 2016 General Elections in the Republic of Uganda. The Mission comprised 40 Short Term Observers from several African countries drawn from the African Union Permanent Representatives’ Committee, the Pan-African Parliament, Election Management Bodies and Civil Society Organizations. The AUEOM assessed the General Elections in Uganda based on the relevant African Union instruments, namely; the 2007 African Charter on Democracy, Elections and Governance; the 2002 OAU/AU Declaration on Principles Governing Democratic Elections in Africa; the 2002 AU Guidelines for Elections Observation and Monitoring Missions; and the legal framework governing the conduct of elections in Uganda. This statement presents the Mission’s preliminary findings covering pre-voting, voting, counting and tallying processes up to 18 February 2016. The African Union will, however, continue to observe the post-electoral developments and release a final report within the next three months. The AUEOM noted that the legal framework for elections in Uganda provides for, and guarantees the holding of regular elections in conformity with regional and international frameworks. This framework comprises the 1995 Constitution of Uganda, the Electoral Commission Amendment Act 2015; the Presidential Elections Amendment Act 2015; the Parliamentary Elections Amendment Act 2015; and the Political Parties and Organisations Act 2005. The AUEOM observed that there is no legal framework for regulating political party campaign financing. The Mission noted that the law expressly prohibits the use of Government resources for campaigning by all candidates and parties, except for the President, as stated in Article 27.1 of the Presidential Elections Act. Stakeholders reported that there has been unprecedented increase in campaign spending. The AUEOM learned that in 2015 Uganda introduced a National Identity Card System, which required the conduct of a mass biometric registration of citizens aged 16 years and above. The EC extracted information of all registered citizens who were 18 years and above to compile a National Voters’ Register. The AUEOM noted that at the end of the National Voter Registration exercise, there were 15, 277,198 registered voters. This Voters’ Register was continuously updated until 11 May 2015 when the process was concluded in line with the electoral calendar. The AUEOM noted that, whereas the use of data from the National Register ensured that all citizens from 18 years by the end of the mass registration exercise were registered; interlocutors expressed concern that the 11 May 2015 deadline for updating the Voters Roll left many potential voters who turned 18 years after that date, disenfranchised. The EC collaborated with civil society organizations (CSOs) in conducting voter education. However, the accredited CSOs raised concerns that their efforts were constrained by late provision of materials by the EC. In addition, voter education was generally perceived to be inadequate. The AUEOM noted that for the first time, two presidential debates were held in Kampala and broadcasted live on television and radio. All 8 presidential candidates were invited to reach out to voters using this platform. The AUEOM observed that despite the unprecedented political and electoral competition, campaigns were generally conducted within the legal framework. However, the Mission noted the 15 February 2016 incident in Kampala, which led to the arrest of an opposition leader, causing anxiety among opposition supporters. The police informed the Mission that the arrested leader and his party had defied the prescribed campaign route. The Mission noted that women were nominated to run as party and independent candidates in various constituencies and that there was one female Presidential candidate. In addition, women contested for the 112 parliamentary seats specially created for them. The Mission noted the participation of youth in the elections both as candidates and in the campaigns. However, there were concerns raised by some stakeholders of the youth being used by political parties to intimidate and disrupt election campaign rallies of their opponents. The AUEOM noted that besides involvement in voter education initiatives CSOs were involved in domestic observation. Thousands of domestic observers were deployed throughout the country, especially in areas considered as hotspots. The AUEOM noted that in compliance with the legal provisions, the media covered political parties and candidates’ manifestos and campaigns. However, stakeholders felt that the state media provided more coverage to the incumbent president and his party, at the expense of the opposition. It was further reported that private media provided a fairly balanced reporting on all parties and candidates. Besides the mainstream print and electronic media, campaigning was carried out on social media platforms such as Twitter, Facebook and Whatsapp. The AUEOM noted general concerns following the shutdown of social media platforms, by the Uganda Communication Commission from Election Day citing security concerns. The AUEOM noted that there was a generally calm and peaceful pre-election environment with no major security incidents reported. The AUEOM noted concerns raised by interlocutors with regard to the recruitment, training and deployment of community policing units called Crime Preventers, which they alleged were misused to intimidate opposition parties. The AUEOM was however informed by the police that these were purely crime prevention units at community level with no arresting powers. The AUEOM noted the lack of trust in security agencies by some opposition parties, which were reported to have created counter units. On Election Day, the teams visited 148 polling stations comprising 60% urban and 40% rural where they observed opening, voting, closing and counting processes. The observers used tablets to capture and transmit real-time observation data to the Mission Command Centre. The AUEOM teams observed opening procedures countrywide and noted that the environment outside these centers was peaceful. Delays in opening time by up to 4 hours were reported in a number of polling stations. The delays were attributed to late distribution of polling materials. Consequently, opening procedures pertaining to sealing of ballot boxes, identification and verification of voters were not fully adhered to in some cases. As per the laid down procedure, voters were asked for identification and their names checked against the register before voting. Only a few were turned away because they did not have the required identification, were not on the voters’ register, were at the wrong polling station or were rejected by the Biometric Voter Verification Kit. With regards to the Biometric Voter Verification Kits, which were introduced for the first time, the AUEOM observed that in some polling stations, the kits worked well, hence hastening the verification process; while in some stations, they were not used because they were either not working, or the election personnel did not have access pass codes. As an additional identification and voting facilitation measure, voter identification slips were used to direct voters to the right voting station within a voting center. Voter processing times were reasonable and mostly ranged from no more than 3 minutes in 54% of the polling stations and between 3-6 minutes in 39% of the polling station stations observed. The AUEOM observer teams observed closing procedures at 4:00pm and beyond in areas where polling was extended because of late opening. Closing and counting procedures were not strictly adhered to in all polling stations visited. For example, there were instances where polling officials and agents did not reconcile the number of registered voters with the number of people who actually voted. In a majority of polling stations observed, party/ candidate agents were furnished with a copy of the results form by the presiding officer. The AUEOM congratulates the people of Uganda for turning up in large numbers to perform their civic duty. While we note that the election process is ongoing, the AUEOM’s overall assessment of the 2016 General Elections thus far, is that they were largely peaceful, but not without shortcomings; in particular, the late delivery of election materials. The late delivery led to more than 4 hours of delays in the opening of polling stations. The Mission wishes to underscore that this impacted on the overall conduct of polling day operations, and caused anxiety and tension among the voters and polling officials, which could have been avoided. • Consider using indoor polling in order to create order around the stations and to protect polling officials, voters and materials from weather elements; and • Consider adopting voting booths that ensure the secrecy of the ballot. The AUEOM recommends that the Government provide adequate resources to the Electoral Commission to conduct continuous voter registration and voter education and enable timely procurement of election materials. • Concludes electoral reforms at least a year before elections to allow for timely preparation and implementation. The AUEOM encourages the public broadcaster to provide equitable coverage to all candidates. The AUEOM recommends that Political Parties avoid the usage of inflammatory language during campaigns and inciting supporters. Lastly, the AUEOM recommends that the Police enforce the law equally on all parties and candidates, and desist from heavy handedness when dealing with the public, political parties and candidates. 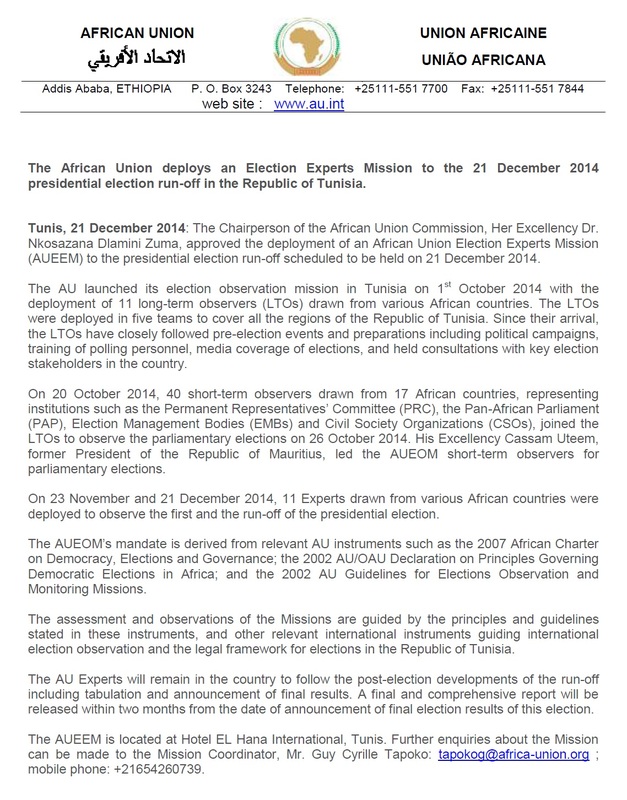 The AUEOM will continue to observe the tallying and other post-election developments and issue a comprehensive report three months after the announcement of the election results.